The use of mobile phones has grown exponentially since the launch of Android and IOS OS. People use mobile devices to manage their bank accounts, transfer money, keep a track of their expenses, browse the web, etc. To make sure that you’re not a victim of internet fraud or your bank and social network accounts are safe, you must use a good security app on your mobile device. 1: Most internet companies ask users to verify their phone numbers by entering an alphanumeric or numeric code sent to their device. If you don’t enter the correct code, you won’t be able to use their service. If a person knowing your user id and password steals this code, he will take over your account or transfer your funds to his account. 2: A keylogger is an app that records your keystrokes and sends it a remote PC. When the data is transferred, the owner of the keylogger or PC will know the login credentials of your online accounts. Avast has launched several security products for Windows and Android OS. As of today, over 400 million users are using its products. 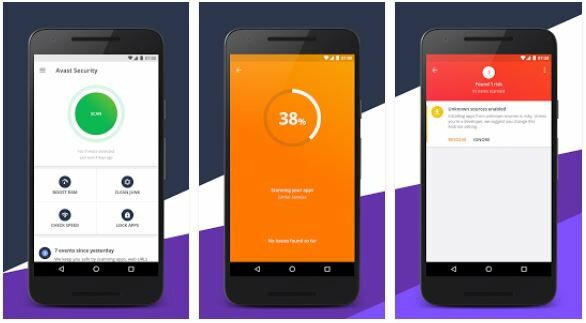 Android version of Avast security has a powerful engine that removes viruses and other threats from your device. The app provides an Anti-Theft feature through which you can erase the data of your lost phone from a remote location. You can also see the lost phone’s location on a map with this utility. The free Avast antivirus app enables you to keep your personal photos private. It includes a WiFi security analyzer tool and a utility to test internet speed. You can schedule scans in this app. Avast has an inbuilt firewall, permission manager, call blocker, and a battery saver utility. Avast records user activities and displays it in a neat interface. It allows you to free up system and storage memory. Don’t want your mom or dad to read your WhatsApp messages or see Snapchat photos? Install and use the free AppLock app. AppLock protects your personal messages, pictures, and videos with a pattern lock, pin code or your fingerprint scan. It will prompt you to enter email id after you set a pattern lock. Don’t worry! The app won’t send promotional emails to your inbox. If you forget the pattern, the AL will send the pattern/pin code to your email address. 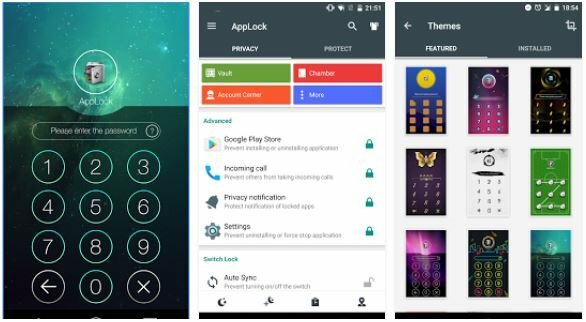 You can configure AppLock to lock new apps automatically after installation. The app allows you to hide photos and videos in a vault. It lets you browse Twitter, Facebook, Google+ and LinkedIn in private mode. AppLock has a built-in incognito browser. It ships with an intruder selfie tool that takes the picture of a person trying to access your apps or device without permission. Duck Duck Go is a search engine that doesn’t track your activities or location. It sources search results from 300+ sites when you type a search query and hit the enter key. It displays relevant search results in a beautiful interface. The search result page boasts an option to filter results by date and country. It also flaunts a toggle option to change the safe search settings. DDG supports different languages. It was launched in 2008. 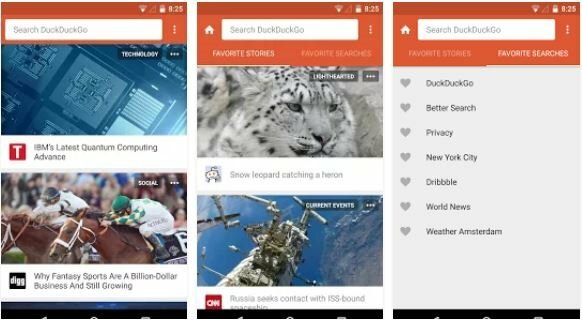 DuckDuckGo is not as popular as Google or Bing, but people trust and use this app because of its good security features. Orbot is a free proxy app that makes you anonymous on the web. It protects your privacy by encrypting the network traffic. If you start the Orbot service on your phone, a number of remote computers connected to the TOR network will handle HTTP requests and responses instead of a single PC. Tor network comprises 1000s of computers. The HTTP response travels across several computers before it reaches your device. Orbot app provides an option to choose a server location. If you don’t choose a country, a smart algorithm will manage the task of assigning computers. Orbot enables you to access blocked websites. It supports Android 4.1+ OS. People risk their social network or bank accounts by saving passwords in a plain text file. 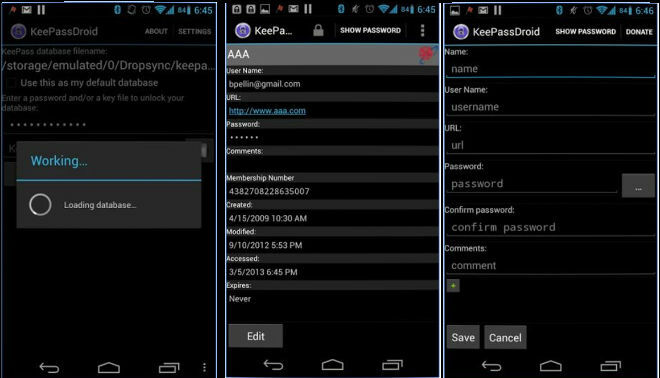 To make sure that no one gets access to your online accounts, you can use KeePass, an open-source Android password manager app. KeePass allows you to save unlimited passwords in an encrypted and password protected database. It saves this DB to the storage memory of your phone. It can generate strong passwords and auto-fill the username and password fields in forms. KeePass enables you to group passwords. It is a small application that doesn’t require an internet connection. Google FMD is a powerful app that allows you to find the lost Android smartphone, tablet or smartwatch. When you run this app, it will ask you to sign into your Google account. You can trace your phone with FMD only if the location service is active in it. Hence, make sure that you enable GPS or GLONASS service on your device before using this app. Find MY Device allows you to leave a lock screen message for the person who finds your mobile device. When location service is enabled, FMD displays the exact location of your handset on Google Map. You can lock your phone or erase its data from the desktop browser. 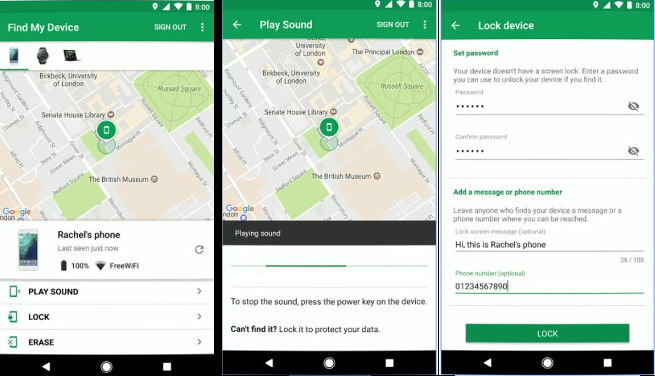 You can also make your lost phone to play sound with this free Android application. Ransomware is a program/app that prevents users from unlocking their device or accessing certain files. To unlock the files/device, ransomware will prompt you to transfer cryptocurrency to a special address. Malware is a malicious app designed to destroy or corrupt files on a computing device. It can lock the user from signing into their favorite apps. Malware can also track user activities and send the tracked data to a remote device. 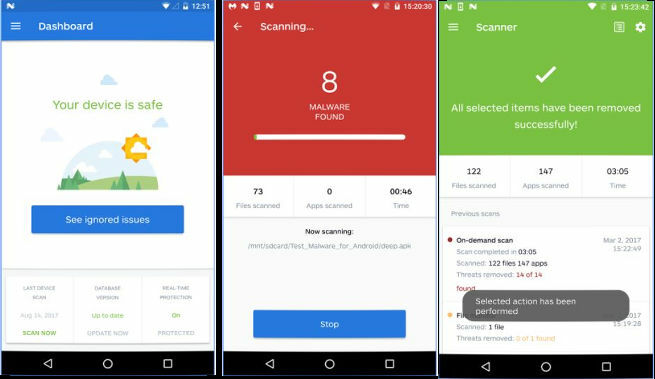 To keep your device malware or ransomware free, you can use Malwarebytes. The free MB app provides a security and privacy auditor tool. It has a malware scanner utility that scans executable files for malicious code. It also analyzes the text messages and makes you aware of malicious URLs. The app lets you schedule a scan operation. It provides an option to fix security issues on Android device automatically. Find My Device, Malwarebytes, Avast Security, DuckDuckGo, KeePass, Appock, and Orbot are the best Android security apps.